HOW TO CARVE: A WATERMELON GOLF BALL (SORT OF) - What About Watermelon? I like to golf. Or, I should say, I used to golf. After many years of hitting the links once or twice a month, I didn’t go at all last year. Not really sure why; it just sort of worked out that way. This month’s watermelon carving, a watermelon golf ball, is a reminder of those lazy spring and summer afternoons on the golf course. It’s also my first carving since last August’s watermelon grill. Grilling and golf? Man, I can’t wait for spring to start! Just like in golf, it helps if you start with the clean ball. Or, in this case, a clean watermelon. Give it a rinse, tee it up, and then let the carving begin! 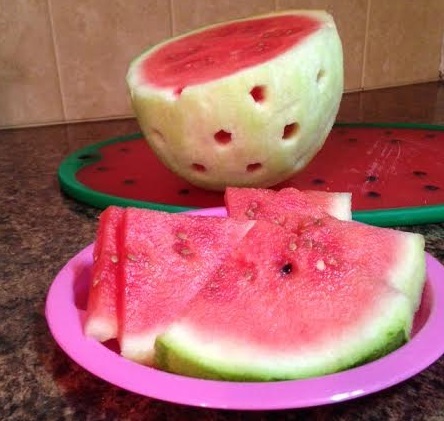 First, cut off the bottom portion of your watermelon golf ball. Not too much, though. Cut off just enough to give the ball (which will eventually be used to hold fruit) a flat, stable base. 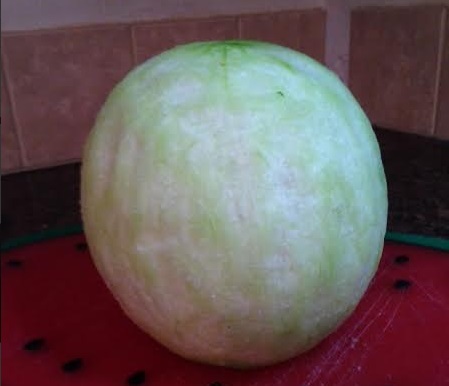 Next, use your potato peeler to peel off the green outer skin of the watermelon, revealing the white golf ball hiding underneath. 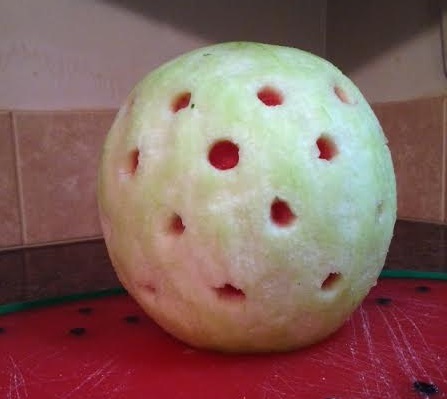 Now it’s time to break out the melon baller to create the dimples in your watermelon golf ball. If you have one of those handy two-sized melon ballers and you’re using a mini watermelon, use the small ball side. 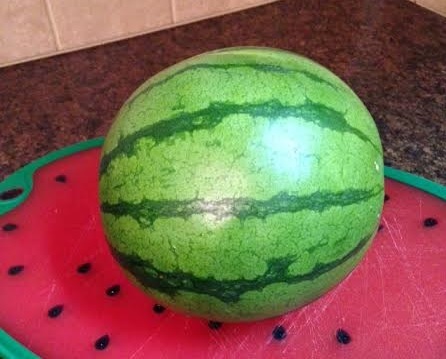 If you have a slightly larger watermelon, use the larger ball side. After your dimples are carved, it’s time to fill it with watermelon chunks, or whatever else you’d like to add to it. 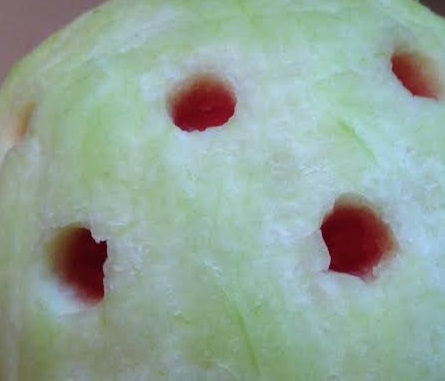 I decided not to fill my watermelon, mainly because, when I carved the dimples, the dimples went all the way into the red flesh (mainly because the mini watermelons have thin rinds). The end result? It’s clearly not my best carving, and it’s proof that even the carvings that sound “easy” can sometimes be challenging. The best part of this carving — like many carvings — was cutting it up and eating it! This is a very cool looking golf ball.